So, we come into the middle of a story here with Samuel and Saul and Jesse and David. A few things you need to know: 1) the people pleaded with God for a king because all the cool kids had a king and Israel didn’t. They had prophets and judges. God didn’t want to give them a king. God said, “a king will just take all your best resources for his palace, conscript your sons into battle and your daughters into his harem. You really don’t want that.” But they pleaded anyway and God acquiesced and gave them Saul. Saul didn’t work out so well. He had a few problems with power. Surely you can think of other modern leaders that we all thought would be great, but turned out to disappoint us. God has a long history of always choosing the least likely of leaders. God chose Abram, a wandering Aramean of no account. God chose Jacob, the second born, instead of Esau, the first born, even though his birthright was received through dishonest means. God chose David, even though at first glance he didn’t look like king material. If you keep reading the story, you find that David is too scrawny for the armor the soldiers are supposed to wear in battle. God sent his son Jesus, not to the family of a powerful Pharisee, or of a influential priest, but as a distant relative of a low-standing priest, Zechariah. Jesus was the son of working class people. Though later the evangelists would go to great lengths to show Jesus’ royalty, in his own day, the people asked, “Can anything good come of Nazareth?” That backward, podunk town? When he was grown, Jesus does not surround himself with powerful people who can “get things done,” but by the most unlikely people. Prostitutes, tax collectors, gentiles, smelly fishermen who are forever ritually unclean because they handled dead animals all day every day. Zacchaeus, the tax collector. Scripture even specifies for us that he’s a short guy. Short guys don’t usually win. If you have spent your life in the church, you know this. You know this, yet as human beings we still tend to look on outward appearance instead of the heart, both in the church and outside of it. In nearly every industry, business and government institution, who are the CEOs? Who are the people on the very top? Tall, wealthy, straight, men of European decent. Yes. If you do the research, you will find that short men make less money than tall men. For the same work! Barack Obama shocked the world, but yet he too was tall, wealthy and straight…just not entirely of European descent. 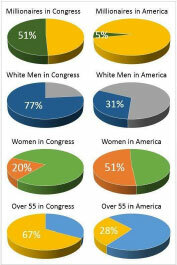 When you look at charts like this1, you see that the majority of Congress is formed by older wealthy men of European descent, even though the national population is more diverse. This is nothing new! It isn’t to say that older, wealth, straight men of European decent are bad! Not at all. This is just the way things are right now. Some of our best leaders have been tall, straight, wealthy and white. Yet, there are no guarantees that just because someone has these physical attributes, that they will make good leaders. 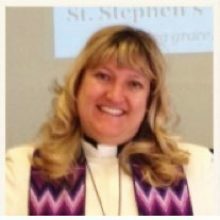 Every week in the office, we get church catalogs, and I always flip through them to look at the stoles for pastors. Just to see if there’s anything new out there. I have commented many times that stoles are made for tall men. They are long and wide. You cannot get a shorter, narrower stole for a smaller man or woman. It is as though the vestments themselves speak. If you are going to have a shorter, smaller pastor, you will need to make adjustments. That’s just out of the norm, even now, forty years after we started ordaining women. 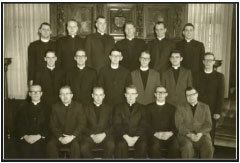 Not to berate the point, but here’s a photo from about the 1960’s, a seminary graduating class. And here’s one from recently, 2012.2 Even in this photo, we do see a lot more women, but we see almost no people of color. What is also interesting to note is that at one time, quite recently really, there were just four professions for wealthy, white, straight, tall men. Doctor, lawyer, clergyman, professor. Perhaps businessman. For women, teacher, nurse, secretary, or homemaker. My, how things have changed, and there’s good news and there’s bad news in that. When things change, there’s always some good news and some bad news. Challenges and blessings. Challenges and blessings. Wealthy, straight, tall, white men can no longer assume that they will be automatically given status and power just because of their physical appearance. That’s a challenge. It is. Young men, my son among them, who grew up thinking things were one way are finding themselves challenged in ways that their fathers and grandfathers and great-grandfathers never had to worry about. And for people who are not wealthy, straight, tall, male, or of European decent, those people can no longer sit back passively and let others lead. They can no longer just blame “the man,” and claim no responsibility. That’s a challenge. It is. Because now no one can take anything for granted. 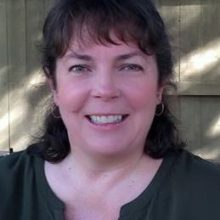 People who usually sat out and observed the world in motion are now being asked to take on more of the burden and lead in ways that their parents and grandparents never had to worry about. For every good thing that happens, there is a challenge. And for every bad thing, a silver lining. A blessing. Now for the silver lining. Aren’t you ready for some good news? God has always been about dismantling unfair systems. Even though the world says that certain people should be in charge, God consistently picks the least likely to lead. In Ancient times, such as in David’s time and later in Jesus’ time, when the people thought that widows and orphans were just worthless deficits to humanity, God included them. In Jesus’ time, when people were divided by race, gender, and economics, God made provision for all. God has always seen the heart and doesn’t make decisions based on outward physical appearance. And in our time, we continue to be divided by race, gender, and economics and God still keeps challenging us and calling us all into service. All of us. All of us equally powerful, yet equally responsible. Martin Luther said it well. We are free as Christians and run our own lives, yet we are also indebted to all and must serve all. We have freedom, yet we also have responsibility. Well, for one thing, this is a blessing for tall, straight, white men. Because tall, straight, white, men no longer have to acquiesce to what society thinks they should be or do. Remember those first “male nurses” and “flight attendants?” How strange it was when tall white males began to become nurses, elementary school teachers and secretaries? Not so strange anymore. Not so strange anymore. Now more than ever, we all get to do what God is calling us to do, instead of fitting ourselves into some category based solely on our outward appearance. What would happen if our institutions, especially the church, kept on looking at the heart more and the outward appearance less? Challenges and blessings. Challenges and blessings. That is what happens with change. May the blessings make the challenges worth it. I do believe they do. Amen.